These labs are dedicated to understanding and configuring OSPF. The lab consist of four separate labs each lab building on the previous OSPF topology covering topic such as OSPF backbone area, Stubby, NSSA (Not So Stubby Area), and Totally Stubby areas, Virtual Link areas, OSPF over Frame-Relay, and redistribution of external network into an OSPF area. These labs have been adapted from a French lab I found. I have formatted it for GNS3 using the 3725 router, but it can be completed in Cisco’s Packet Tracer or with real hardware. Understand and configure OSPF backbone area 0. Understand and configure OSPF secondary areas. Understand and configure OSPF Stubby, Not So Stubby, and Totally Stubby areas. Understand and configure OSPF virtual like areas. Understand and configure redistribution of external routes. Understand and configure OSPF over Frame-Relay. Understand BBR, ABR, ASBR, and internal OSPF router types. Basic configuration of multi-area OSPF. OSPF on the point-to-point Ethernet and NBMA (frame-relay). Setting priorities to influence the election of the DR and BDR. Redistribution base of another protocol. Type particulers area (stub, totally stub and nssa). Create a Totally NSSA area. Understand and configure a virtual link area. Verify the operation of the virtual link. OSPF attempts to elect a DR (Designated Router) and BDR (Backup Designated Router). 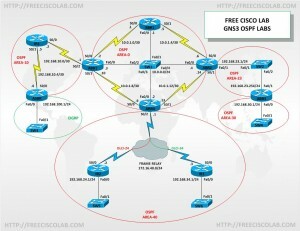 I hope you will find these OSPF labs helpful in understanding and configuring OSPF. Most labs have the solutions in the final config file that are included in the download, but some labs like the challenge labs do not have a solution. For this labs there are many ways to obtain the same results which usually is full connective.